Brett P. Abner, Attorney at Law - Tomchin & Odom, P.A. Brett P. Abner is originally from Winter Park, Florida. He has more than 30 years of legal experience in Jacksonville, practicing commercial litigation, bankruptcy law, and protection of creditors' rights. Mr. Abner also gave ten years of service in the United States Army Reserve. Mr. Abner is admitted to practice in Florida and South Carolina. He is also licensed to practice before the United States District Court for the Middle District of Florida and the United States Court of Appeals for the Eleventh Circuit. He is AV® Rated by Martindale-Hubbell®, the highest peer-review rating available for excellence in legal practice and ethics. He graduated in 1982 from Furman University with a degree in Economics and Business Administration. Mr. Abner went on to obtain his law degree from the University of South Carolina in 1985. Immediately upon his graduation from law school, Mr. Abner began his law career as an associate with Robert F. Anderson, P.A., a boutique bankruptcy firm in Columbia, South Carolina. 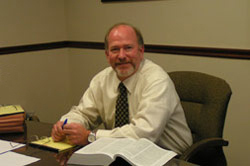 He came to Jacksonville in 1987 to work with Mahoney Adams & Criser P.A., which later merged with McGuireWoods LLP. In 1999 Mr. Abner joined Sharp & Gay, P.A. as a senior associate, and in 2001 he became a partner at Hiday & Ricke, P.A. Throughout his career, his practice has involved general consumer and commercial litigation as well as bankruptcy and creditors' rights. Brett P. Abner has lectured before the Jacksonville Bar Association, the National Business Institute, and Lorman Education Services. He joined Tomchin & Odom in 2008. Contact Sandy Caulder to make an appointment for a consultation with Mr. Abner. Call 904 353-6888 to make an appointment with Brett Abner.